The hypothalamus is the gland in the body that creates the hormones that are secreted by the pituitary gland’s neurohypophysis. It’s in charge of managing hormone production and secretion in the body, helped along by the actions and counteractions of the pituitary glands. The neurohypophysis releases a hormone, and the adenohypophysis produces hormones that regulate the other’s actions. 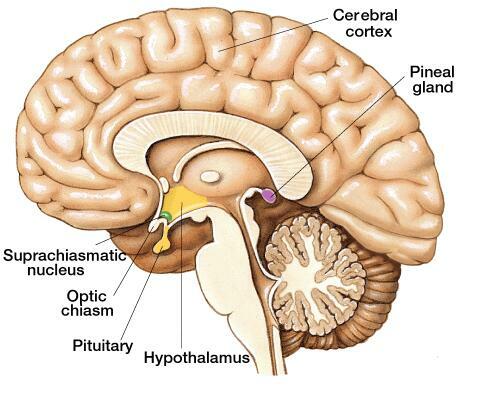 Another name for the pituitary gland is the cerebral hypophysis. It is located in the inferior side of the brain, within the diencephalon. The brain is attached to the pituitary gland through the pituitary stalk. Resembling a pea, the pituitary gland is very small with its overall size of 1.3 centimeters. It’s structured by the sphenoid bone’s sella turcica and is covered with dura mater. This gland has quite a demand for blood, and it gets its supply from the cerebral arterial circle. The gland can be segmented into two parts: the anterior lobe and the posterior lobe. The anterior lobe is called the adenohypophysis and the posterior lobe is the neuropophysis. Each of the segments functions as a structural lobe and a functional lobe. In an adult body, the adenohypophysis is differentiated into the pars distalis and the bulbar segments. The thin section that divides the two is called the pars tuberalis. In a fetal body, what separates the anterior lobe from the posterior lobe is called the pars intermedia. As the fetus develops, this thin tissue begins to belnd with the surrounding cells of the anterior lobe. The process goes on until it gets completely unnoticeable in an adult body. The neural portion of the pituitary gland is neorhypophysis. This is the posterior part of the gland and it’s formed by the bulbar lobus nervosa, in part. A stalk is connected to bulbar lobus nervosa, making it possible for the pituitary gland to attach to the hypothalamus’ base. Resembling a funnel, this stalk is called the infundibulum. This is a connecting tissue that allows the nerve fibers and the pituicytes to connect and pass.